Online gambling win up in Ontario, but still inconsequential for Canada. For years now, several Canadian provinces have been delivering online gaming products to their legal-age residents. For most of those years, regulators have complained that international gambling sties are siphoning millions of dollars offshore. According to a new gambling revenue report, not much has changed. The report, compiled by Fantini Gaming Research, indicates the total gaming revenue for all Canadian provinces in 2017. Overall, gambling revenue rose 4.9% to $17.3 billion from the previous year. Because most provinces lump their iGaming revenue with other services, it’s impossible to provide an exact total of online gaming in Canada. British Columbia combines internet with lottery revenues, totaling $1.285 billion. Quebec displays online casino revenue, worth $45.75 million in 2017, but merges internet and retail lottery sales at $1.828 billion. Ontario is the only province to truly separate their revenue streams. And if their results are any indication, many more Canadians continue to utilize internationally regulated websites for their iGaming needs. It’s a fair assessment, too, considering Ontario accounts for about 43% of all gaming revenue in the country. Ontario is home to Toronto, the largest city in all of Canada. It is evidently the gambling capital of the nation, as well, pulling in $7.445 billion of the overall $17.3 billion generated by gambling in 2017. That figure represents a 12.1% increases year over year. In fact, without Ontario’s surge in YoY gaming revenue, the rest of Canada would have risen just 0.07%. 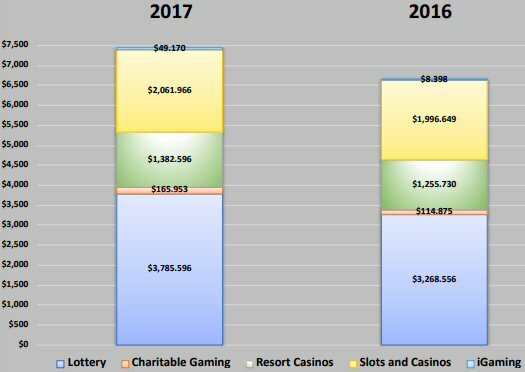 Based on this chart, it’s clear that iGaming revenue is rising at a considerable rate. Compared to $8.4 million in 2016, internet gambling saw a phenomenal increase of 485%, up to $49.2 million in 2017. That is impressive; no argument there. However, looking at the report’s follow-up graph (below), iGaming is, and always has been, dwarfed by all other verticals. Here, we see this tiny blue line frosting the surface of one very thick, multi-layer cake of gambling revenue. That little blue line indicates the iGaming revenue for Ontario, which now makes up 6.6% of the overall value. On the bright side, 6.6% looks a lot better than the mere 0.126% it accounted for in 2016. While those positive percentages are great for provincial regulators, there’s still a considerable lack of iGaming revenue flowing through Ontario; and most likely BC, Manitoba, Quebec and the provinces of Atlantic Canada, as well. Why is it that Canada continues to struggle with online gaming? What is all boils down to is competition in player acquisition. Those offshore casinos are dangling some mighty sweet carrots in front of Canadian players. And while there are no laws on the books preventing Canadians from accessing offshore websites, there are laws that prevent provincial regulators from matching their competitor’s services. 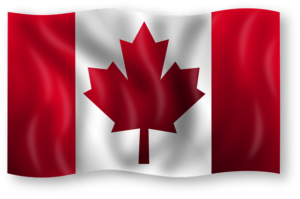 Just recently, Canada online casinos have begun promoting welcome bonuses for new players. That’s something their overseas rivals have done for years; in much greater quantity and quality, at that. The new sign-up bonuses are a good start, and have been noticeably effective. However, the game variety is still much more limited, and the sports betting opportunities aren’t even comparable. In Canada, sports betting requires a parlay bet on no less than two contests. That was also recently changed from a minimum of three picks per bet. Straight up betting is not legal in Canada, online or on land. But international sites operate under international regulations, where straight up betting is perfectly acceptable, and encouraged. Thus Canada’s online sportsbooks simply cannot compete with their offshore rivals. Until more laws are amended to give players the same opportunities at home-grown gaming sites, Canada’s online gambling win will remain inconsequential compared to all other revenue sources.